Since the birth of cinema, film has been lauded as a visual rather than a verbal medium; this sentiment was epitomized by John Ford's assertion in 1964 that, "When a motion picture is at its best, it is long on action and short on dialogue." 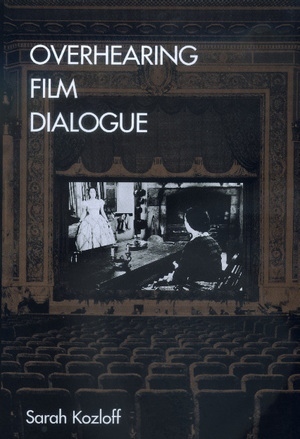 Little serious work has been done on the subject of film dialogue, yet what characters say and how they say it has been crucial to our experience and understanding of every film since the coming of sound. Through informative discussions of dozens of classic and contemporary films—from Bringing Up Baby to Terms of Endearment, from Stagecoach to Reservoir Dogs--this lively book provides the first full-length study of the use of dialogue in American film. Sarah Kozloff is Professor and Chair of film studies at Vassar College. She is the author of Invisible Storytellers: Voice-Over Narration in American Fiction Film (California, 1988).